A few years ago, in 2009 to be exact, I had the opportunity to tour and photograph the decrepit remains of Chippewa Lake Park. I had never visited the park during its active operation which lasted 100 years, from 1878 to 1978, but many of my Ohio raised friends had very fond memories of visiting during their childhoods. After the park shut down in 1978, it was left to decay for over 30 years, so at the time of my visit only the vestiges of good times past still remained. Mother Nature had taken her toll! 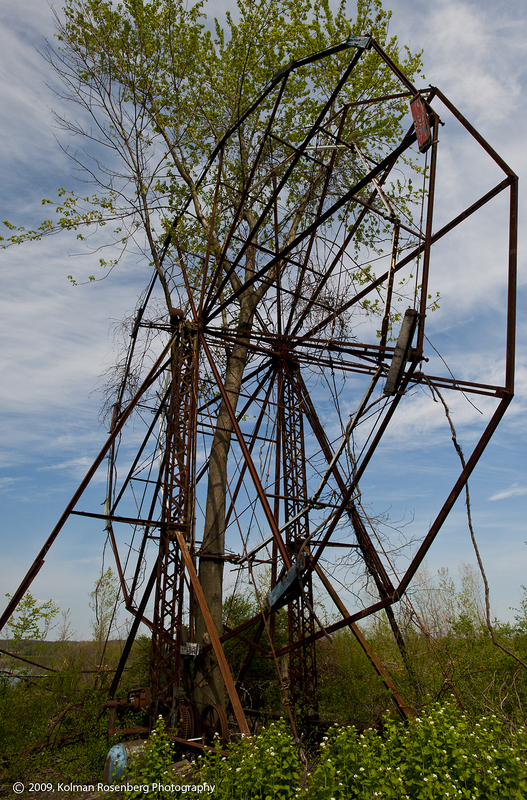 A tree grows thru the remains of the ferris wheel. The scene in 2009 was rather surreal with a mature tree growing right thru the middle of the old rusty ferris wheel. All throughout the remains of the park were rusting remnants of rides and their tracks, falling wooden buildings, and fleeting memories for those who had enjoyed childhood moments here. The wall that says it all. I came across this one remaining wall of one of the buildings and between the graffiti painted sad clown face and the comment painted on the wall to the right (The old fortune teller lies dead on the floor. Nobody needs fortunes told anymore. ), I thought it pretty well summed up the demise of this once vibrant park! Ironically, I think many of us would like to have our fortunes told these days! 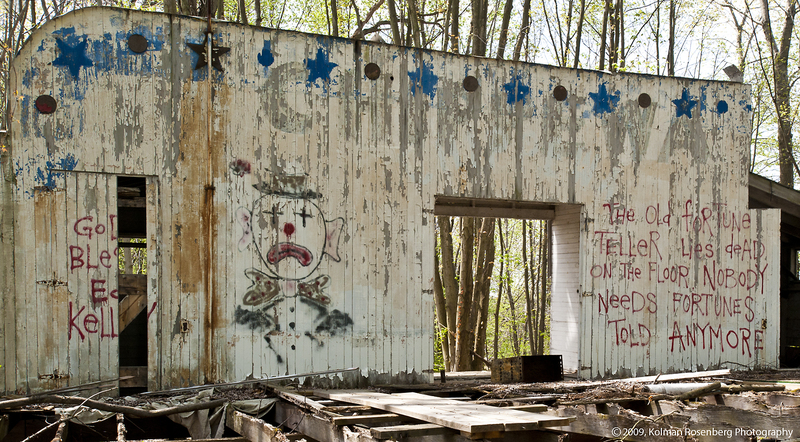 This entry was posted in Uncategorized and tagged amusement, Childhood, Chippewa, Chippewa Lake Park, Clown, Decay, Ferris Wheel, Medina County, OH, ohio, park, Rides, Roller Coaster, track. Bookmark the permalink. I am so glad that I subscribed to your photography blog – I enjoy it immensly. I grew up outside of Philadelphia PA, spent a lot of time in Ocean City NJ – my sister has a condo there on 6th St right off the boardwalk. I took Photography this past Summer at the Cleveland Photographic society and you taught at least one of our classes. Thanks for a great blog – really enjoying it. Hi Ethnea, Thanks for your nice comments on my blog. I grew up across the river in Camden and Haddon Twp. Did we get to talk at the CPS classes? Hi James, I believe most of Chippewa Lake has now been bulldozed. There were plans to build a development there but I’ve heard the economy has slowed down all of those plans. I never went there when it was open, but it looks like it was a wonderful old style amusement park! Thanks for sharing the wonderful pictures. It is sad to see that it is no more.